I don’t know about you all, but I haven’t been doing much cooking in the past week. I felt highly under-utilized on Thanksgiving. We had about 45 people over but basically all the food got brought in. I seasoned the two turkeys we made- that was IT. The other two turkeys, the desserts, pretzel jello, stuffing, veggies, mashed potatoes, even the dinner rolls showed up with all of my wonderful family members. I can’t really complain because the food was awesome, but I like to have something I made in with the spread. On Saturday night we had my mom’s side of the family over, so I was able to help with the sauce and meatballs and contribute my favorite chocolate chip cookies to the mix. My 8 year old cousin Tyler declared that my cookies “really look more like scones,” but ate at least two without complaint. Then I trucked back to Baltimore with leftovers of everything in tow. So this is my first dinner back in the game. I finished my hospital rotation today and rewarded myself with a trip to Wegmans (normal) and picked up all the stuff for these pretty little squash bowls. Comforting and colorful, but HEALTHY given that I ate my body weight and most definitely cancelled out that cleanse while I was home. Brush the squash halves with olive oil, salt and pepper and roast at 400 degrees for about 30 minutes or until caramel-y and soft. The goal here is to create a (mostly) edible bowl. 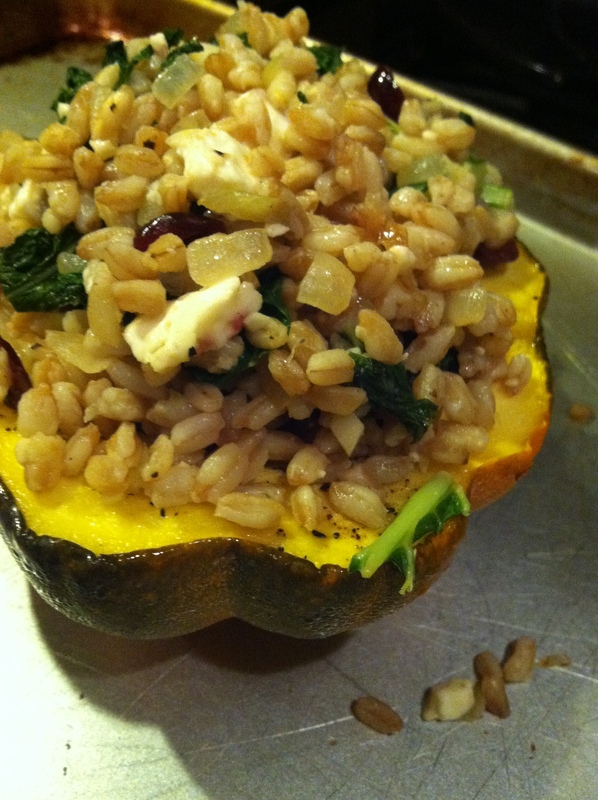 Cook your farro. 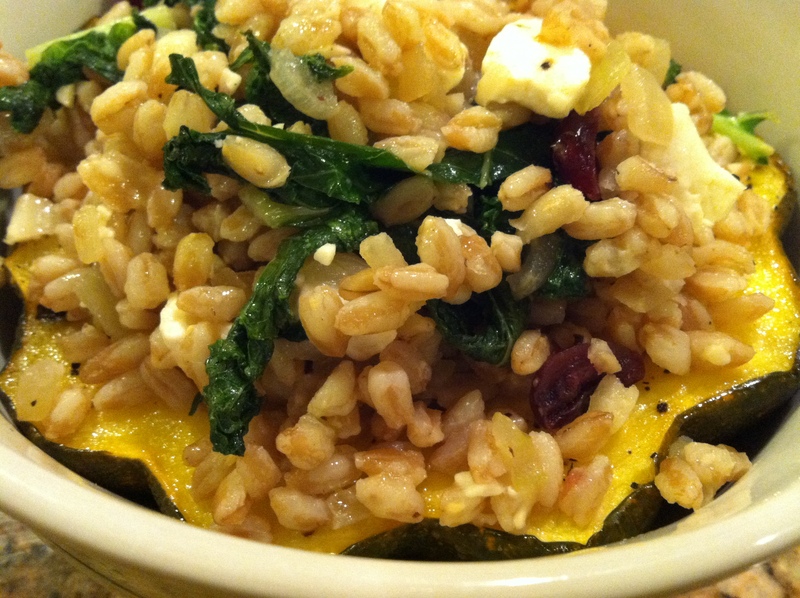 My package directions said “for fluffy farro, do not stir while simmering.” Lies. All lies. The bottom burns. Just stir it, it will still be fluffy. I combined about 1 cup of farro with 2 1/4 cups chicken stock and brought it to a boil, then turned down the heat and simmered until the liquid was all absorbed. Remove from heat. Saute the onion in a little olive oil until slightly browned, then add the kale and garlic. Add another splash of chicken stock to help the kale wilt down. 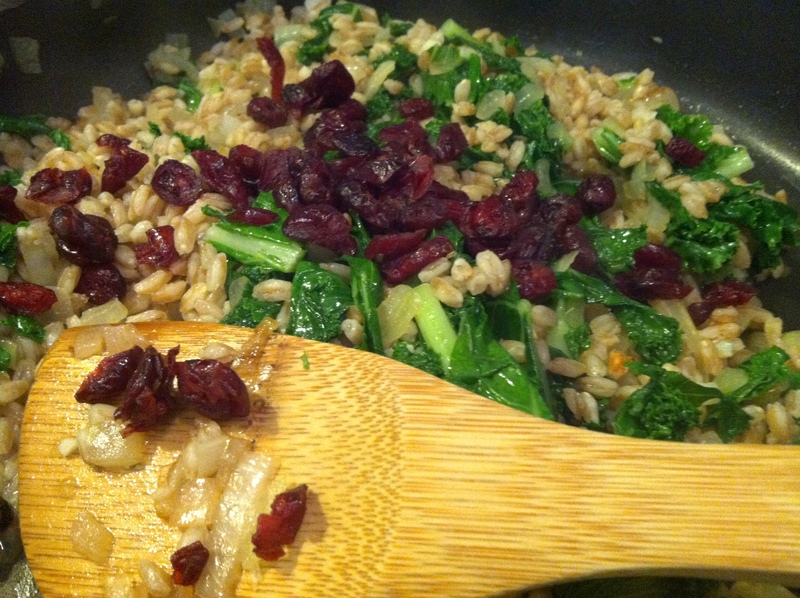 Add the farro to the pan, then stir in your craisins. Turn off the heat, and add the feta. So colorful and pretty! 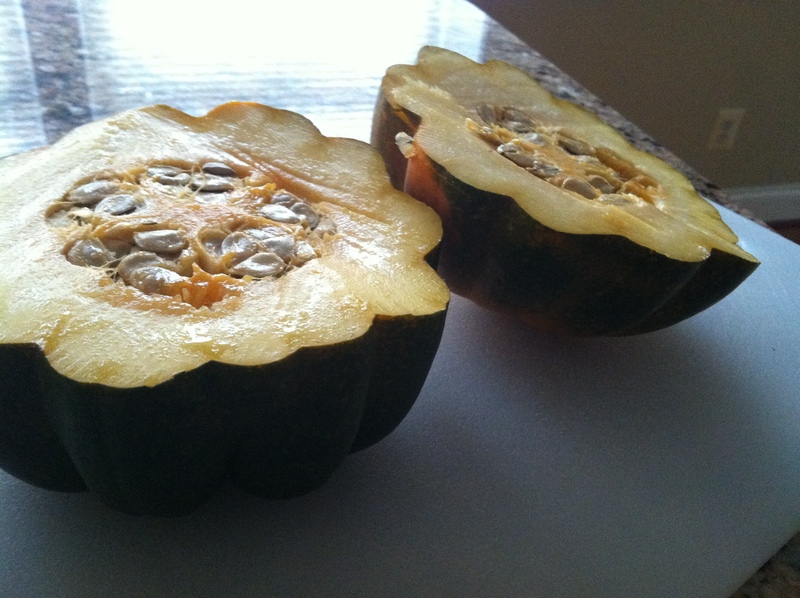 You can stuff the squash halves and eat right away. I did this as a make-ahead meal, so I put the cooled mixture into the cooled squash halves, and re-heated at 350 covered with foil for about 15 minutes. More warm and fuzzy meals coming your way this holiday season! Okay not actually fuzzy. If it’s fuzzy throw it out.